DATA FIRST PARADIGM – Can a Nation’s Data Capacity Boost its Growth Potential? Data has to be at the center of any meaningful use of digital. Continuing with the debate on The 7 Pillars of Digital India’s Next Leap Forward, we present a deeper perspective on data. Here’s a white paper from Coeus Age that presents a holistic argument on ‘data first’ paradigm and how data capacity can serve as a precursor to a nation’s growth and development. A workshop for government leaders has also been designed for them to participate in the ‘data first’ journey. The adage ‘data is the new oil’ resonates strongly with both business enterprises and governments. For the latter, it can pave the path towards better citizen experience, governance agility and enhanced transparency. Meaningfully exploiting the massive increase in transactional, operational and social data can create a data driven government that is transparent, accountable and results driven. Building the data capacity for exploiting data using latest technological advances in the machine learning and AI domain can be a springboard for a fast-developing nation like India, giving it a sustainable competitive advantage. The white paper provides a holistic argument for a ‘data first’ paradigm that is fast ushering upon the businesses and governments across the globe. It also builds upon the idea of a New India and how that can be given a boost by enhancing its ‘data capacity’. We would love to hear your perspectives on ‘data first’ paradigm and ways to enhance the nation’s ‘data capacity’. You can reach out to us at kds@kdsnext.com. 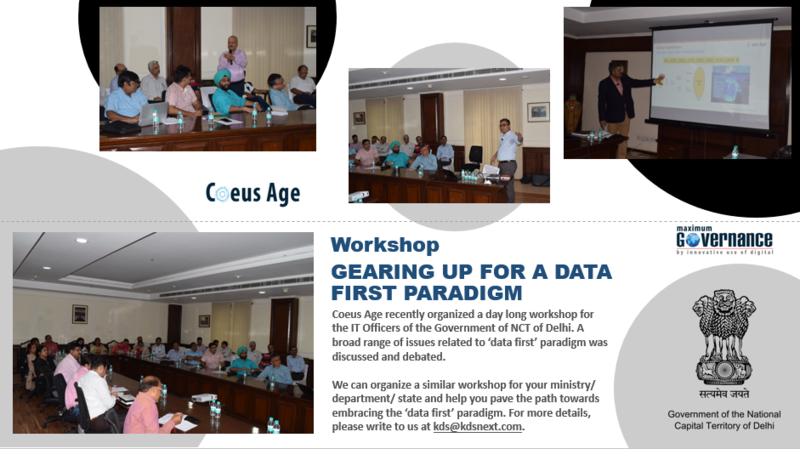 Coeus Age brings a well designed workshop to appreciate and operationalize the ‘data first’ paradigm for government leaders. Coeus Age along with Tableau, recently organized a day long workshop for the IT Officers of the Government of NCT of Delhi. A broad range of issues related to ‘data first’ paradigm was discussed and debated. We can now organize the workshop for your ministry/ department/ state and help you pave the path towards embracing the ‘data first’ paradigm. For more details, please write to us at kds@kdsnext.com. Realizing the Dream of DIGITAL NORTH EAST – Taking the Next BIG Leap Forward!